As has been stated throughout this website, the Vector Equilibrium (VE) is the most primary geometric energy array in the cosmos. According to Bucky Fuller, the VE is more appropriately referred to as a “system” than as a structure, due to it having square faces that are inherently unstable and therefore non-structural. Given its primary role in the vector-based forms of the cosmos, though, we include it in this section. The most fundamental aspect of the VE to understand is that, being a geometry of absolute equilibrium wherein all fluctuation (and therefore differential) ceases, it is conceptually the geometry of what we call the zero-point or Unified Field — also called the "vacuum" of space. In order for anything to become manifest in the universe, both physically (energy) and metaphysically (consciousness), it requires a fluctuation in the Unified Field, the result of which fluctuation and differential manifests as the Quantum and Spacetime fields that are observable and measurable. Prior to this fluctuation, though, the Unified Field exists as pure potential, and according to contemporary theory in physics it contains an infinite amount of energy (and in cosmometry, as well as spiritual philosophies, an infinite creative potential of consciousness). 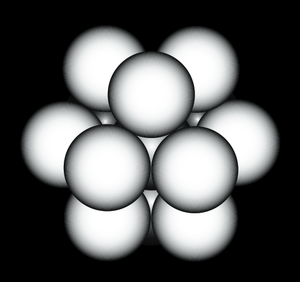 The VE also has the attribute of consisting of four hexagons symmetrically arrayed in four planes. As can be seen in the illustration below, there is one at the equator or horizon plane (red), one encircling the whole VE as if being viewed from directly above (blue), and two at left and right-tilting angles (green and purple). They are all 60°s from each other, and the angles they define are exactly the same as those of the faces of a tetrahedron. 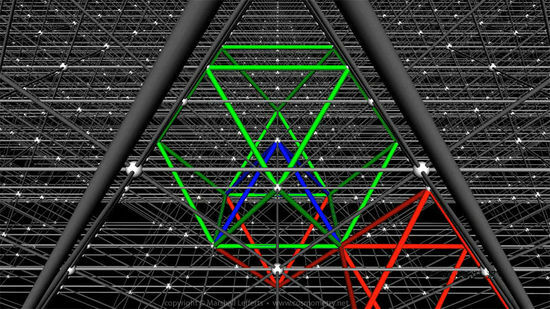 According to Fuller, this is the zero-tetrahedron, wherein the tetrahedron’s faces have all converged simultaneously on its center point. (It is also significant to note that the 8 triangular faces of the VE symmetrically match the 8 triangular faces of a star tetrahedron as well, this being a polar-balanced geometry of the tetrahedron’s most basic structural form; see the Tetrahedron page for more on this). 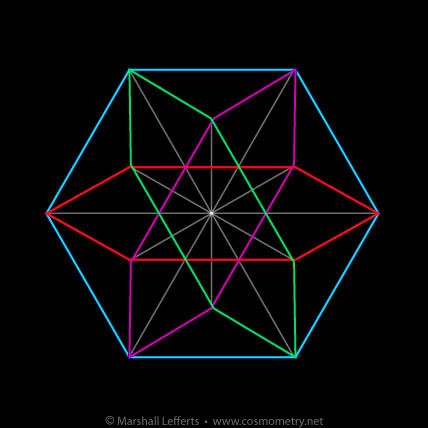 It is because the VE has these four hexagonal planes defining its spatial coordinates (and therefore, too, the IVM) that Fuller says that the foundation of the cosmic geometry is actually 4-dimensional, as opposed to the conventional 3-dimensional 90° X,Y,Z coordinate system historically assumed to be fundamental. 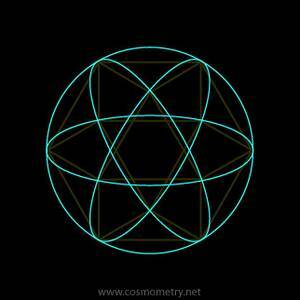 It is to the symmetrical arrangement of these four hexagonal planes that we align the four phi double spiral field patterns in the basic model of cosmometry. In essence, the points of these hexagons all touch the surface of a sphere, and the phi double spiral boundaries define in the simplest manner the great-circle vectors of a spherical VE. This form, pictured below, is also known as the Genesa Crystal, and is purported to possess the property of balancing and cleansing the energy of the environment surrounding it for a distance of 2 miles when using a 16” diameter model. (See this link for more information on the Genesa Crystal, and this video of one inhabiting the center of the garden at the Perelandra Center for Nature Research in Virginia, USA). In essence, this simple form, even when built solely of copper or brass strips or tubing, sets up a resonance with the underlying structure of the Unified Field, thus creating an island of coherence is a sea of naturally occurring “chaos,” amplifying the equilibrium state throughout its surrounding local field. This will be significant when we explore in the next section the dynamic nature of the VE’s ability to contract and expand and transfer energy and information seamlessly throughout the entire Unified Field across all scales instantaneously. 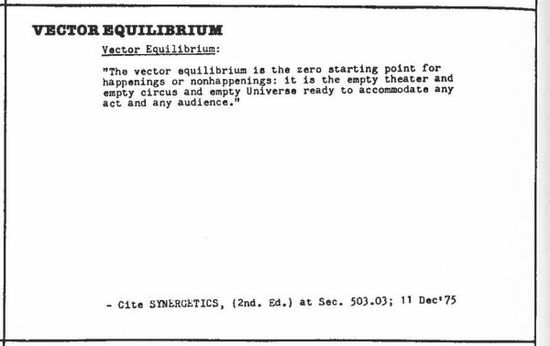 So far we have looked at the VE in its static state (or more correctly, its ultimate dynamic equilibrium zero state). In other words, we’ve looked at the form in its state of perfect symmetry. 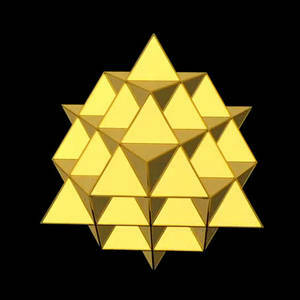 What is also quite remarkable about the VE is that, given it has six square faces and that squares are inherently non-structural (only triangles are structurally stable), the VE has the ability to “collapse” inward, drawing the twelve outer points symmetrically towards its center point. As it does so it goes from its state of perfect equilibrium (the zero-phase) into a dynamic “spin” that can contract in both clockwise and counterclockwise directions. When contracted and expanded alternating in both directions, it exhibits a dynamic “pumping” action that Fuller called the Jitterbug (after the dance of the 1930’s that was popular at the time he was exploring this phenomenon). It is due to this dynamic jitterbug motion of the VE that the entire manifest universe arises, and most fundamentally that the five platonic forms arise as the foundation of all structural geometry in the cosmos. To understand this, first consider again that the VE (and whole IVM) is the conceptual zero-phase cosmometry of the Unified Field. The Unified Field has an infinite energetic and creative potential. This potential is untapped until an impulse is introduced that causes the IVM to go out of equilibrium, and when it does so it “collapses the field” (as is often said in quantum physics when the consciousness of an observer seeks to determine the location or angular momentum of a quantum energy event) and an extremely minute amount of the Field’s infinite energy comes into a polarized dynamic of spin, differential, form and motion. A local energy event has emerged from the otherwise invisible and non-measurable Unified Field (a local energy event being something as basic as a photon, electron, proton, etc, and growing in complexity all the way to the macro scale of super-massive galactic clusters). Once a local energy event has arisen, a dynamic tension arises between its center point (its local “gravitational center”) and those in its near proximity as the contractive force of the collapsed field “pulls” on the surrounding field, and the center of each event tries to pull the others inward towards itself. 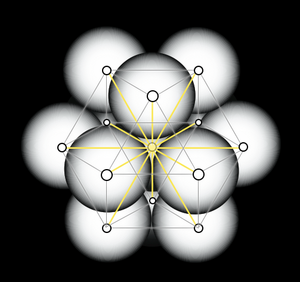 When a stabilized system of such points arises, a geometric “tensegrity” form of energy is created. The center point of each event can be described as the “singularity” around which the event is manifesting that remains connected to the infinite energy/density of the Unified Field. In this way, we can say that everything has a center point, and all center points are one (because they are continuously connected to the Unified Field’s IVM structure and therefore entirely and constantly unified). It is this unification of center points that explains non-local effects in the quantum realm that are proven to exist experimentally, wherein a change in the state of a quantum particle will simultaneously cause the same change in state of a paired particle across vast distances instantly (apparently violating the proposed cosmic “speed limit” of the manifest universe that is traditionally defined as the speed of light). As stated, as soon as the IVM/VE goes out of equilibrium, all of the dynamic forces that are observable and measurable arise — mass, angular momentum, spin, charge, etc. Differential is introduced as the once perfectly calm Unified Field fluctuates and the jitterbugging motion causes waves to emanate into the field, creating what we call the spacetime field of manifest universe. At the quantum level, this jitterbugging is happening at such a high rate (1044 times per second, the rate at which quantum particles are said to pop in and out of existence) that we do not realize that it is constantly going back and forth between the manifest state (out of equilibrium) and the non-manifest state (perfect equilibrium VE). Again, this quantum dynamic shows how everything in the universe is both individual and unified simultaneously. 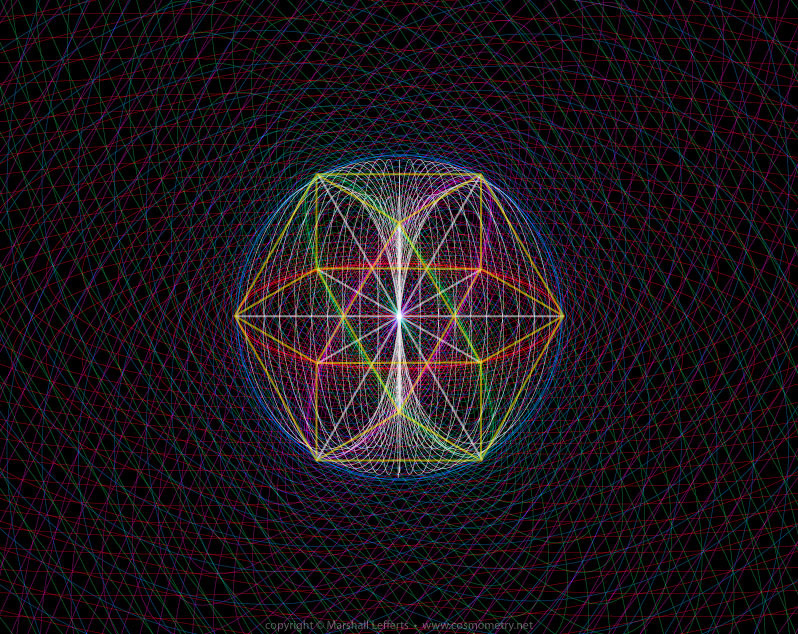 What is remarkable about the cosmometry of this jitterbugging dynamic is that, in one swift motion all of the primary geometric forms — the platonic structures — come into energetic manifestation. As has been repeatedly mentioned, Fuller called the VE’s geometry the zero-phase. As the VE collapses inward and the square faces contract across one of their diagonals, the length of that diagonal distance becomes the same length as the VE’s edges. 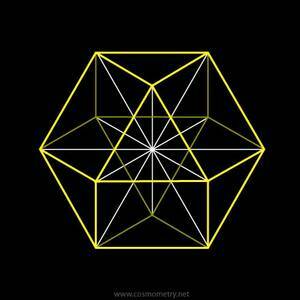 At this moment the symmetry of the icosahedron arises. 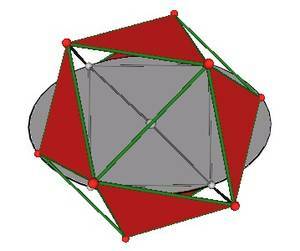 This is what Fuller calls the icosahedral phase. (Note that the dodecahedron is the symmetrical “dual” of the icosahedron and is therefore energetically implied at this phase as well; and according to researcher Robert Gray, there is also a dodecahedral phase further along the contracting VE’s motion as illustrated below). Continuing on its inward journey, the square faces of the VE continue to contract across the diagonal until the gap is completely closed. 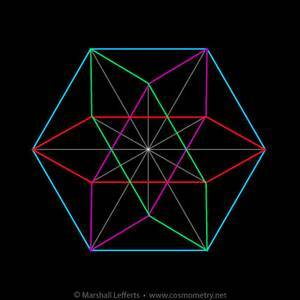 At this moment the symmetry of the octahedron arises. This octahedral phase now displays a doubling of the vectors of the VE, creating an extremely strong bonding tension as is found in atomic elements that have octahedral symmetry. (Note that the cube is the symmetrical dual of the octahedron and is therefore implied in this phase as well, and as noted above is also inherent in the primary symmetry of the VE itself. From the viewpoint of a physical model of a VE contracting through these phases, the octahedron can be seen as the minimum contraction state, after which the jitterbugging motion must expand again and return to its fully expanded VE phase. From a purely energetic viewpoint, though, this motion can continue, and ultimately it reaches the phase of symmetry of the tetrahedron. 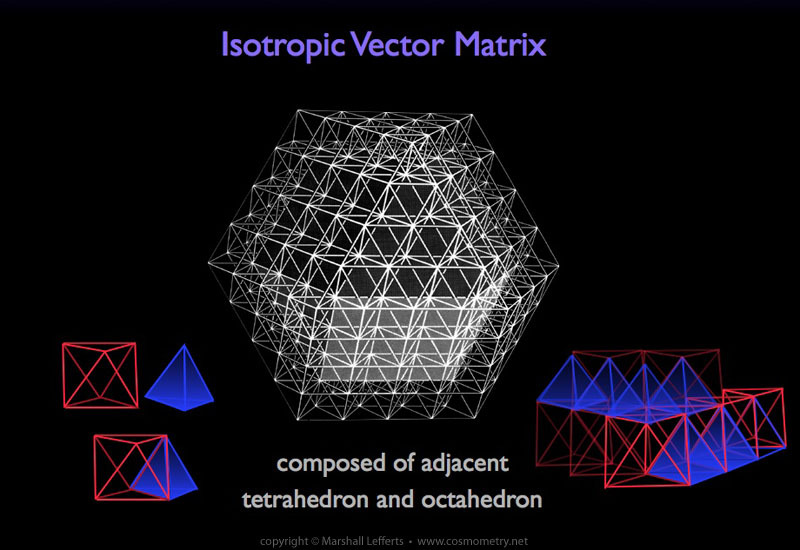 In fact, it is even possible to show this using a physical model, being able to spin the jitterbugging contraction past the octahedron phase and folding the model into a tetrahedron (now with the vectors bonded four-fold). And this can also then be further collapsed into the most fundamental unit of structure, the triangle, with the VE’s edges now bonded six-fold — all without breaking any of the connections at the corner points of the VE model. In this way, we have now shown how the VE — the zero-phase potential of all form — inherently contains all of the primary platonic structures, and that they arise from the dynamic fluctuation of the Unified Field as it collapses through the various platonic phases into manifest form. Depending on the resonance of the dynamic tension (tensegrity) of the energy events at play, the different geometric forms will be seen as the underlying symmetry of structure. 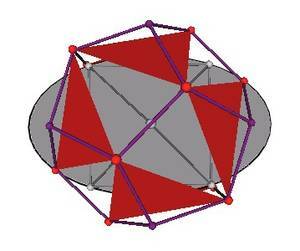 As mentioned previously, the collapsed VE can be seen to have the octahedron as its fully contracted form. And as also mentioned, the octahedron can also be wrapped around the fully expanded VE form, with the faces of the octahedron symmetrically aligned with the triangular faces of the VE. As such, we can then see how the same octagonal form is present at both the minimum and maximum phases of the jitterbugging motion, and can therefore also be deemed to fill either role at any moment (or both roles simultaneously, more appropriately). This is the fractal scaling nature of the dynamic motion of the VE wherein one scale’s maximum (VE form) has wrapped around it the next larger scale’s minimum octahedron form. 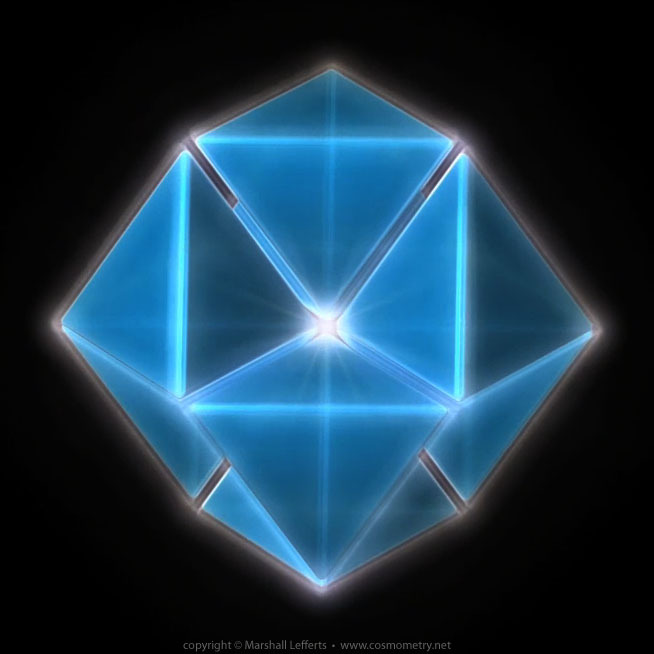 This new minimum then expands to become the next scale’s maximum VE, itself then having the next minimum octahedron wrapped around it, and so on moving expandingly and contractingly up and down the cosmic micro to macro spectrum. The next animation illustrates this phenomenon showing the simultaneous expansion and contraction alternating between scales and meeting in the octahedral moment that is symmetrical to both the manifest octahedron phase (minimum contracted state) and the unmanifest zero-phase of the VE. In this way we can see once again that inherent in the dynamic flow of energy in the quantum field is a continuous return to the zero-point Unified Field, at which moment all is instantaneously and infinitely unified. And as this next animation illustrates, there is also an instant and infinite exchange of information throughout the entire field, depicted here as the small triangles that are picked up by the larger triangles and carried further up the scale ad infinitum. Each triangle is a packet of information relevant to the fractal scale at which it exists, and as soon as this packet of information reaches its new maximum expansion state, it becomes instantly available to the entire Unified Field. In this way, all information about energy events throughout the entire cosmos is instantly and constantly available to all other energy events in a cosmic feedback loop of individual and unified holographic integrity. This simple dynamic model and its implications as described lend a logical cosmometric explanation to such phenomena as clairvoyance, clairaudience, long-distance healing, quantum entanglement, etc. The scaling ratio of this relationship is a doubling of the VE’s diameter at every iteration. It is octave scaling such as is found in sound frequencies and music. It is also important to understand that the jitterbugging motion of the VE within the isotropic field exhibits both an expansive and contractive dynamic simultaneously, with VE's adjacent to each other "shunting" energy through the matrix. This illustration by Robert Gray and Foster Gamble depicts this dynamic pulsation. As the VE jitterbug spins inward it sets up a differential of energy density (i.e. pressure, electromagnetic charge) that sets in motion a dual vortex flow that creates the form of a torus. The pumping of the jitterbug sustains this toroidal form in a balanced rhythmic exchange of energy that flows through the manifest system. From a fractal-holographic perspective, it is this fundamental dynamic that takes place at every scale, first expressed as photons, then sub-atomic particles, which then aggregate into the geometric arrays of atoms, which aggregate into compounds that form crystals, minerals, cells and organs, and then whole organisms such as trees, animals, us, and then ecosystems, atmospheres, planets, stars and galaxies. At every scale the toroidal flow dynamic is active as long as the coherence of the manifest energy is maintained. Once the coherence is lost (as energy dissipates or is disrupted due to internal or external factors), the toroidal form will no longer remain stable and will resolve back into a state of dynamic equilibrium. A good example of this is the appearance and disappearance of vortexes in a stream of water. The dynamic equilibrium is the stream moving as a whole. Within this stream the water will interact with an object like a rock, and the resulting pressure differentials will cause a collapse of the water’s field into a vortex (the vortex being, in this case, the visible portion of a complete toroidal flow dynamic that is occurring invisibly in the water). According to physicist David Bohm, this is the true nature of the underlying field (sub-quantum field, as he calls it) wherein there is a continuous current of flow (which he termed the holomovement) within which vortices of energy emerge (as photons, electrons, etc). These vortices are both distinct in their form and completely connected to each other and the whole current, just as is the case with water. This idea and the characteristics and principles related to the torus are explored in the Torus - Dynamic Flow Process section.